Use Your Words: Color Me BAD! Do you remember when you were little and your mother told you to stop throwing that tantrum and USE YOUR WORDS? Welcome to the August edition of the Use Your Words blogging challenge, hosted by the lovely and ever so wordy queen of the baking universe Karen of Baking in a Tornado. Today’s participants have carefully chosen 4-6 words that are then assigned to another blogger to weave into one entertaining post! Check out the links below this post to see how other bloggers are using their words! They were submitted by the delightful and not really so villainous Joy of Evil Joy Speaks! This year in an attempt to be physically fit I made a decision that I was going to run a 5K. After all, my husband was training for a half marathon, and it only made sense that I would subject myself to bodily torture by signing up for something that I might actually have to do some running in. After months of making excuses, I finally gave in and signed up for one. 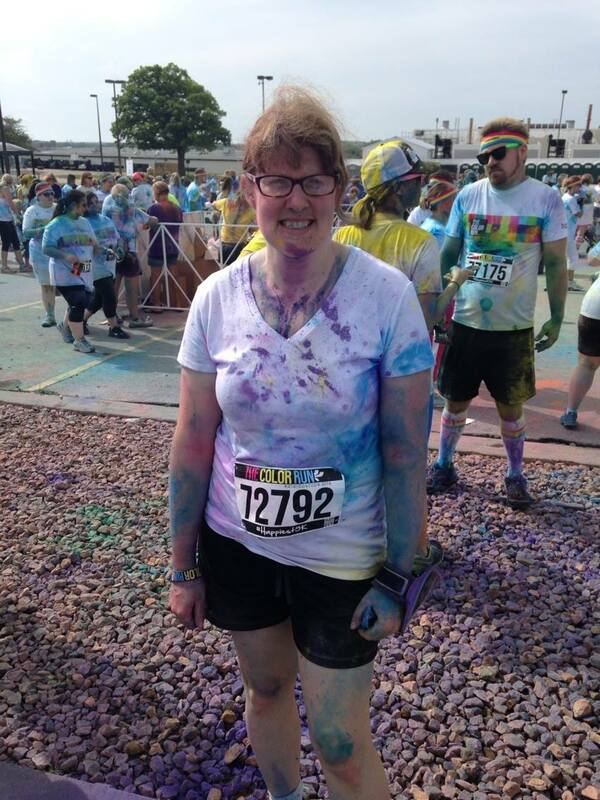 Not just any 5K, The Color Run, otherwise known as the Happiest 5K on the Planet. Not only did I sign up, I created a team. And people even signed up to be on this team. And then my husband said I needed to run it. In July. When it’s hot. The good feeling? Definitely gone, replaced by panic and fear. Keep in mind that I don’t run, I walk. And though I understand that many people that sign up to do these things actually do walk the whole thing, it really made sense that maybe I should push myself a little. No I wasn’t going to Walk Like An Egyptian, I was going to try to run the damn thing. This Spring I prepared by doing the 5K right here in town. I literally had to open the door and walk a couple of blocks to be there. I also had to take my children with me. It turned out ok, don’t get me wrong, but I think it would have been better to have done it alone. Kids think you are tormenting them when you make them do any physical activity, let alone walk 3.1 miles. I chronicled the event here if you care to take a gander. Time flew and before I knew it the weekend of the Color Run was upon us. I had been home all summer with my kids, and let’s face it, physical fitness and training and all that stuff was not really happening. Because that would be active, and being active is silly. And my team? Most of them chickened out. They had excuses, but they still chickened out. Luckily, my husband rose to the occasion and filled in. After all, he ran a half marathon, this would be like the buzzing of flies to him, right? Let me explain a little more about this race. When you run the Color Run, you start out wearing all white, like below. Then you walk or run and they throw colored powder at you at several places along he way. That’s right, they THROW STUFF AT YOU! But you know what? I ran about half of it. That’s a huge accomplishment for me. Considering I didn’t really get to train, that’s pretty darn good. And I didn’t die. Luckily, we got done before it got too hot and the humidity caused my hair to frizz too badly. I was pretty colorful when we got done, luckily I didn’t end up looking like a smurf like so many pictures I’ve seen from this race! … And after. This is okay because purple is my favorite color. I even had color in my teeth! I had color in my hair, in my teeth, in my snot, and in places all over my body that I am not even going to begin to mention. But it was fun. And you know what? I’m definitely going to do it again next year! Next 5K is the Glow Run in October. That will be fun. And maybe, just maybe, I might get to train for this one with the kids back in school! What words are my peeps using today on their blogs? Check it out by clicking on the links below!!!!! This entry was posted in ADD, Anxiety, Family, Fitness, Friends, Humor, Kids, Marriage, Motherhood and tagged 5K, Baking In a Tornado, Running, The Color Run, Use Your Words, Walking by thesadderbutwisergirl. Bookmark the permalink. That’s great that you were able to bring it to the local kids! It’s a very well organized event that’s well worth participating in. Congratulations on achieving both the 5K run and managing to seamlessly weave “Walk like an Egyptian” into the post. Yeah that took a little talent, didn’t it? Can’t wait to hear about the Glow Run! Yes, that’s a hint! Yes I was smiling at least part of the way. I’m really looking forward to the Glow Run! The best part of this whole story is that you liked it so much you’re going to do it again next year. Great story and I love how you weaved your words into it! I was really stumped, I’m glad I remembered about people looking like Smurfs after the run or who knows what I would have written! Haha. I did have a friend run in one of those and he did look like a smurf after. LMAO. 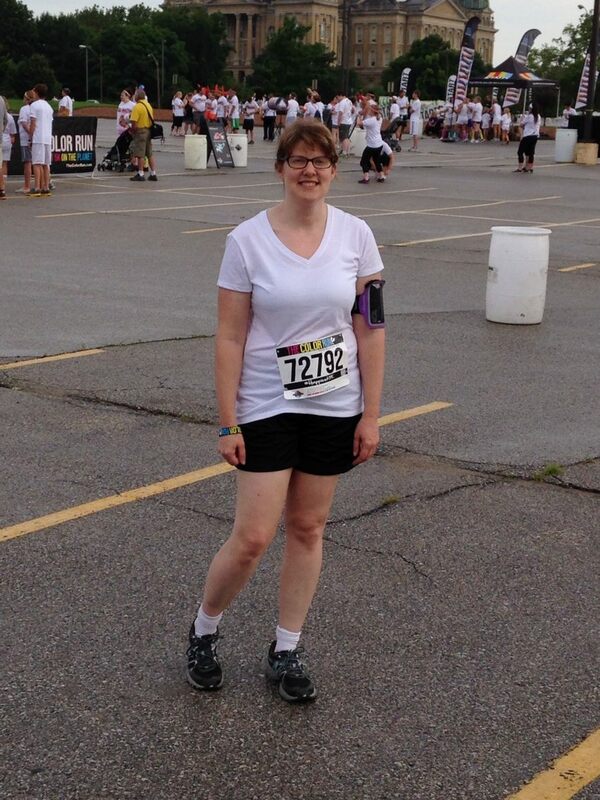 So next time you decide to be crazy and sign up for a 5K… Advice… I did this once sort of. I ran in the Air Force, a lot. I hated running. I wavered out of it as much as possible. My joints are not awesome. Anyway, my friend got a job campaigning for a politician friend, and he was coming in town to run the 2 mile Homecoming run and needed a buddy to run with him, and I’m the only person she knew who might do it. So of course I did. I didn’t train at all for it, but before the run, I drank a 5 hour energy drink. I ran a helluva lot more than I thought I could handle. Then I walked another few miles in a parade for the same friend. After that day, I couldn’t feel my quads for a week. I was actually kind of bedridden the next day. We were pretty dead the next day, I’m not gonna lie! I’ve thought about doing a Color Run or Zombie Chase. They look like fun! It was fun. And a good first 5K to run because of it! So cool that you did this! Nice job on the 5K. I have some friends who did that one and said it was fun. They were washing color out of every crevice for days! Excellent use of your words!!! I really want to do a Color Run!!! I will one day. I definitely need to build up to it.